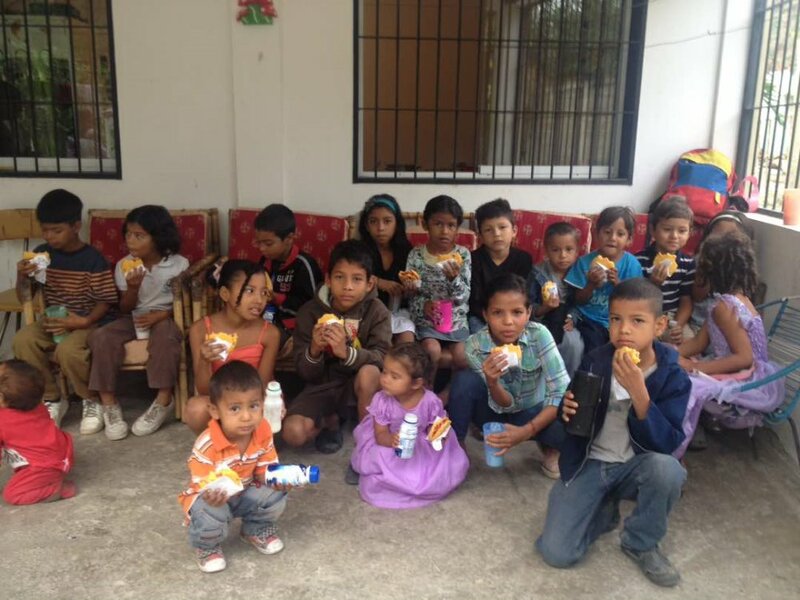 Fundraiser by Meals Hope : Help hungry kids in Venezuela! Help hungry kids in Venezuela! No child should grow up hungry! No child should die of malnutrition! Stefany lived in Parroquia San Martín de Porres, Ciudad Guayana, she was two but looked eight months old, her skin was dried out, her arms skinny. She died in August. Her sister says that the family eats, what little they can find, only once a day. “When my belly and my head hurt cos I’m hungry, what I do is go to sleep”, she says. A pale nine year-old girl fainted in front of her class, she had not eaten anything that day, and maybe not the day before either. In her school, cases of malnutrition have gone from 43 to 98 in a month. “We think that around 70% of the students struggle to get fed,” says the head teacher. More and more frequently children in Venezuela are fainting in class or not going to school because they are too weak; they have not eaten. Many abandon school to help earn money for their families. Many mothers are filling their babies’ bottles with water and rice or cassava to ‘cheat hunger’; they cannot find milk. Parents are crying at night because they could not feed their kids. People looking for food in bins has become a regular and heartbreaking sight in cities around the country. Adults and children are rapidly losing weight, children are dying of malnutrition or illnesses associated with it. Hunger has entered many homes and now dwells there. How can we remain indifferent? After listening to these stories, a group of Venezuelan friends got together. Our hearts hurt, we are filled with pain and rage. For days we couldn’t sleep. We felt impelled to act, to do something. We came up with the idea of raising funds to support projects that help people in poor ‘barrios’ (shanty towns) in Venezuela to feed their kids. Projects that could go some way to saving lives, to stopping the anguish of nights with empty stomachs, the pain of hungry children missing school or working on the streets, struggling like adults in a disfigured world. We called our project Meals4hope. 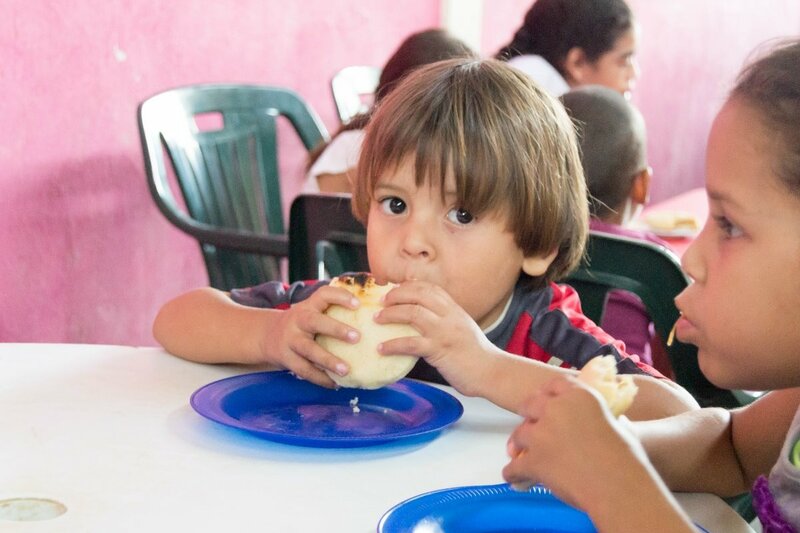 Meals4hope is now an NGO registered in Spain (G67011585), which supports nutritional recovery programmes for children in extreme poverty in Venezuela. We are currently working in 9 areas of the country: Anzoátegui, Apure, Bolívar, Falcón, Lara, Mérida, Nueva Esparta, Portuguesa y el Distrito Federal. Among our main programmes are: nutritional recovery care centres (monitoring and tackling malnutrition), community homes (where children receive daily meals), school meals, nutritional support for hospitalized children, support for nursing mothers, local food production (community, school and family vegetable gardens and allotments), as well as packages of medicines and medical supplies. These projects are seeds sown against hunger. They are benefitting over 1700 children directly. These seeds will grow if we nurture and water them. Together we can do so much! 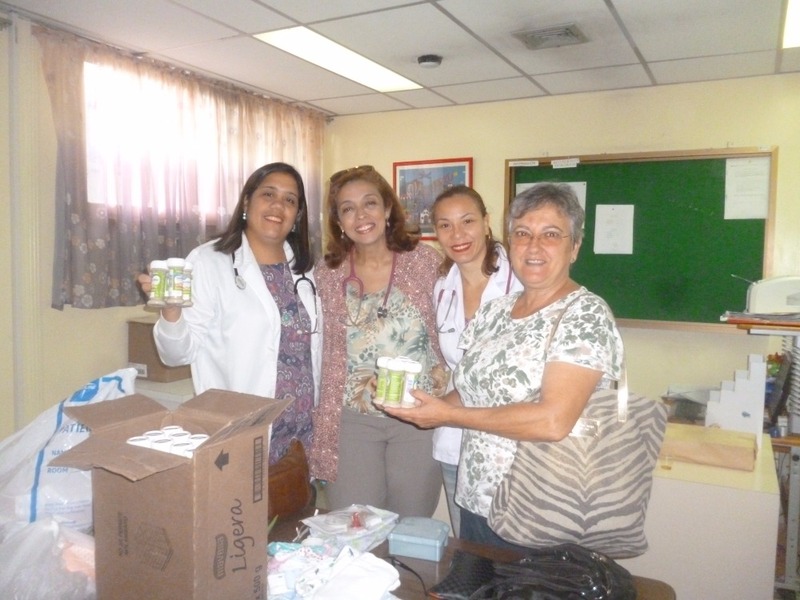 Meals4hope is voluntarily run by volunteers both in and outside of Venezuela. The funds received here are either invested directly in the community projects outlined or in buying and sending them food, baby formulas, nutritional and therapeutic supplements, and medical supplies. We keep supporters updated on the progress and the impact of the projects, through our social media presence and via monthly newsletters (email). Every bit raised will make a huge contribution to tackling child hunger and malnutrition, and bring hope to children in need. Hungry children in Venezuela need our help! As always, we want to THANK YOU on behalf of our children. We want to talk to you about the children that , thanks to you, we are able to support. We want to tell you about the new projects that help fight hunger and malnutrition, and the communities involved... we want you to know how much your support actually helps. However, we have to also mention the worsening situation in a country in crisis, where mothers cry over children lost to malnutrition, to hunger, to lack of medicines, to infections contracted in unhealthy hospitals, to negligence, to corruption. A situation that became more critical through the recent economic measurements established by a regime that has hijacked the country and its people. The exodus of people from the country is massive. Many remain, asphyxiated, and losing their smiles. That's why every smile, every project that unites a community, every child fed is an act of resistance. We carry on, with your support, working with others to aid in this emergency, building spaces of life today and seeding alternatives for the future. What we do, we do it thanks to you. Today we bring you some stories and a little summary of some of the programmes of which you are a big part... THANK YOU! The adoptive parents (not the ones who bought them) provide a home filled with love for these two innocent souls. They are grateful for the support we continue to provide. We are thankful we are able to help them. Yoikeber is 7 months old and weighs a little over 2 kilos; he is little more than bones and skin. His mother, also malnourished, breastfeeds him. It is not enough. Mary goes to the hospital to give them specialised formula. There, other mothers come to her asking for milk, in despair. Even the doctores spoke to Mary, “we have nothing, where do you find it? can you help us? here many children need it” a massive anguish fills the room. Yudaliz, the baby's mother, is very thankful; Mary leaves crying, with a heavy weight on her soul. In the Nutritional Recovery Centres in Ciudad Guayana, we are supporting approximately 200 children. We monitor their weight and height, provide them with nutritional supplements, supporting them until they reach the right height and weight. Over half of them, are under-3-year-old, the most vulnerable. One of the volunteering mothers tells us that what she most enjoys in the programme is "seeing the children recuperate, seeing the happiness of the mothers ... as it was in my case"
In Jully and August we were able to send 915 kilos of medicines, baby formulas and food. Boxes filled with love and solidarity, sent through networks of volunteers in many countries around the world. Acarigua, Barcelona, Barquisimeto, Caracas, Ciudad Guayana, Duaca, Maracaibo, San Fernando de Apure, Valencia and Zea are some of the places where this aid has arrived. 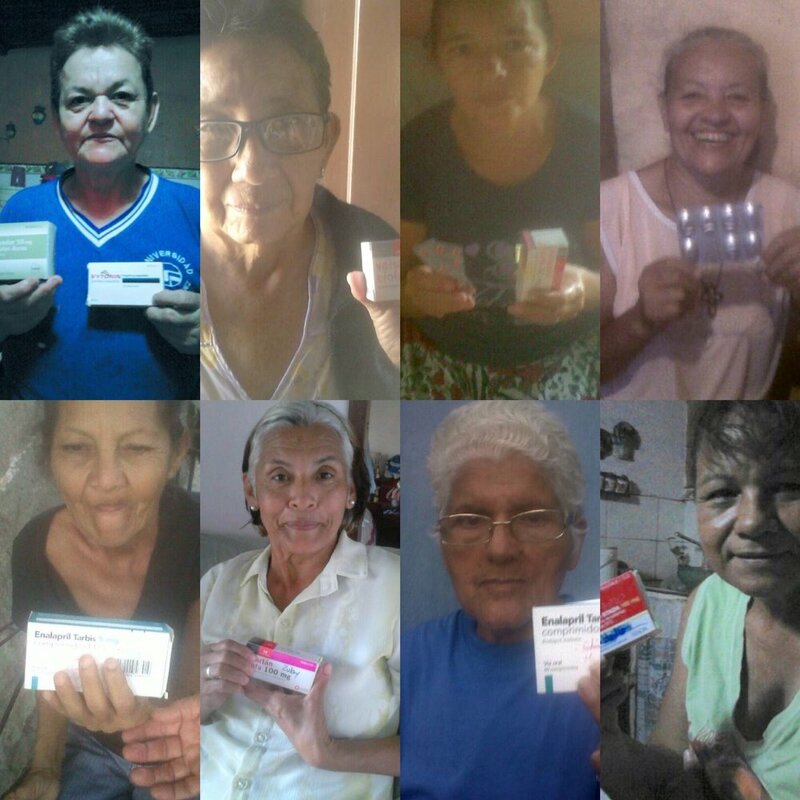 Thanks to your support, what doctors in Venezuela qualify as a "treasure" and mother as "formulas for life", is benefiting more people every day. Your help means so much to us and to the children and families in Venezuela! Thanks to your help, we are reaching more families and children in need. Thank you for helping us help them... you are making a difference in their lives. 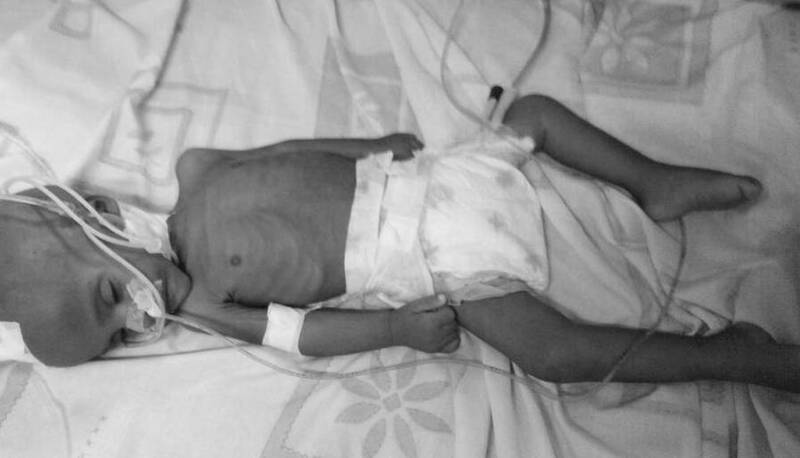 Almost two years ago Juán David, Josefina’s youngest child, suffered severe malnutrition. 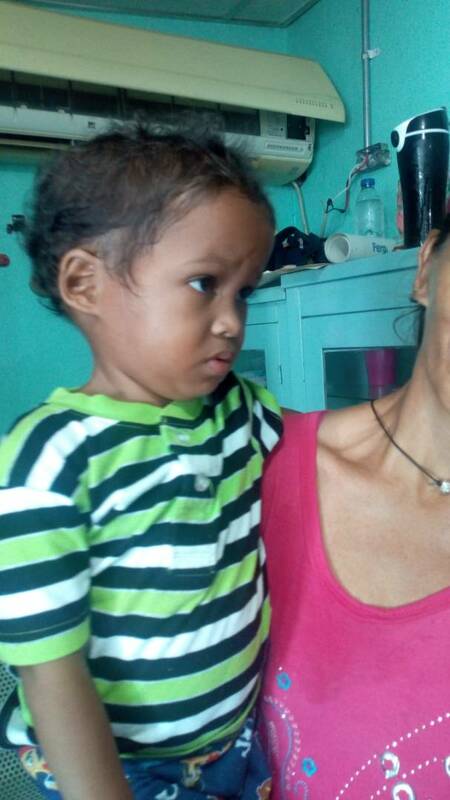 With his photo we started our campaign to provide food for children in need in Venezuela; we continue to support Juán David (amongst hundreds of children) daily, in a recovery process that has not been easy, with more than one hospitalisation. At the start of the month, when he went for his check-up, we had the lovely surprise of seeing that he had gone into the normal ranges of height and weight for his age... he is now 11.1 kilos! Today’s picture shows us one of those small miracles that are achieved with love, dedication and solidarity, THANK YOU! Every child is a reason to keep working for Venezuela every day. The situation becomes progressively worse, inflation and shortages of food and medicine affect more and more people. According to a recent survey on life conditions in Venezuela, 80% of homes suffer from food insecurity, 64% of the population has lost on average 11 kilos, meals are nutritionally unbalanced. There are horrifying accounts of mothers deciding which child to feed on a given day. The number of people dying for lack of medical treatment or food is on the rise. It is a complex humanitarian emergency. Countries around the world and humanitarian organisations need to act, but they feel unable to do so because the government forbids their aid. Thanks to your support and the commitment, love and voluntary work of so many people in the country, we are able to help more and more children in need every day. This month we started 3 new projects, providing nutritious food to 200 more children, and we were able to send 250 kilos of medicines to different parts of the country. Thanks to many anonymous, generous people that expect nothing in return, we continue to make children smile, seeding hope. We continue to grow, to support Venezuela; thanks to you we continue to fight hunger with solidarity and to seed hope. In the name of the children that we support through our programmes, and all the people that benefit from the medicines we send, once more, Thank You! Juán David today ... thanks! Together, for our children, we keep going. Thank you so much for yout support! We bring you some news from the projects you are supporting. The humanitarian crisis in Venezuela keeps growing every day. We continue, thanks to your solidarity, creating networks, adding volunteers and working to bring food, medicine and hope to children in need. Two weeks ago, we opened a new Community Nutrition Home. Mary opened her home to receive children form her community, giving them a full, nutritious breakfast every day; she lives in El Ujano, a poor area of Barquisimeto. The children were chosen, through tears, by the teachers of the local school, as they are the most in need, they were the ones fainting in class or not attending school, because they had not eaten. Initially we planned to help 15 children and slowly grow, but after a couple of days there were already 25 children. Today, two weeks later, there are 30 children going to the Nutrition Home, some from the school and some younger ones. One of the mothers has joined Mary and helps her daily. Between December and January we sent over 500 pounds of medicines to Caracas, Ciudad Guayana, Barcelona, Barquisimeto, Zea and Acarigua. These medicines were given directly to people who needed them, to trusted doctors and local health centres. The health system in Venezuela is in intensive care. Many people are suffering, becoming more ill and dying due to lack of medication. Guaranteeing the right to health is a responsibility of the State, but in Venezuela the “state” not only shrinks this responsibility, but refuses to open the way for humanitarian aid that would save lives, violating Venezuelan’s human rights to health, food and live. In the meantime, the work of worried people are helping many receive the treatment they need. 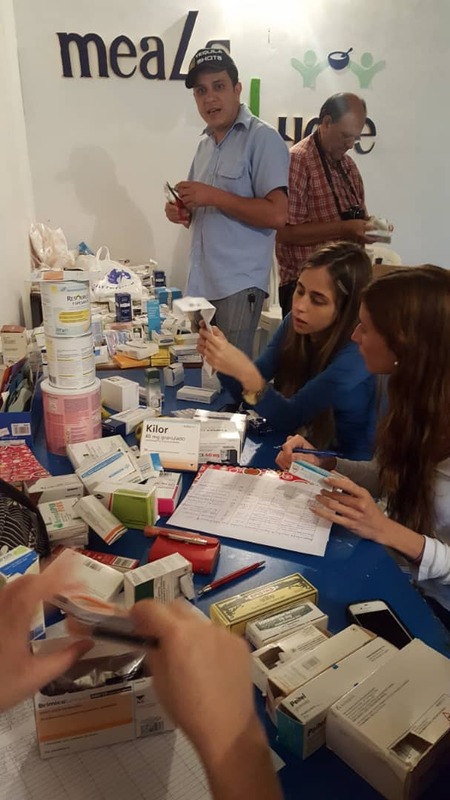 A million thanks to those who donate medicines, who organise collections, who classify and prepare packages, who donate money to buy medicines and pay for postage, who distribute the medicines in so many places in Venezuela… thank you to so many people!! The Community Nutrition Home in Zea helps 37 children every day; it is a moment of noise, laughter, togetherness, support and feeding in more than one way. The volunteers provide nutritious food made with love. The older children help by serving the food, doing the washing up and helping the younger ones. A few days ago, 5 very poor children came by, asking to be part of the programme, they had nothing to eat. “We asked them in and they ate” says Mercedes, the programme coordinator “I don’t have the heart for letting a child go hungry”. How we wish that those that run the country would hurt, like Mercedes, in the face of hungry children, that they wouldn’t leave them without anything to eat! Thank you for supporting us in providing food for our children and allowing us to feed those that knock on our doors. Through the “A Notebook4Venezuela” programme of the Engagement Foundation, we were able to provide 720 children with a notebook for school in Mérida, Portuguesa and Anzoátegui. Many did not have anything to take to school, others were re-using old notebooks, some were recycling loose pieces of papers from local offices. “The notebooks came straight from heaven… we needed them so much!” said some of the teachers. The notebooks were a gift for the children, the teachers and parents. In addition to helping with their studies, that new notebook, clean and full of colour, tells the children that they are very worthy … that we love them. A further 960 notebooks are on their way to children in Margarita, Barquisimeto, Araure, San Félix and Boconó. Your support makes these links that support our children possible … once again, thank you! In addition to supporting the children in our programmes, with the donations we receive we can help individual cases of extreme need. This month we would like to tell you about Isaías, Yan and Nancy. 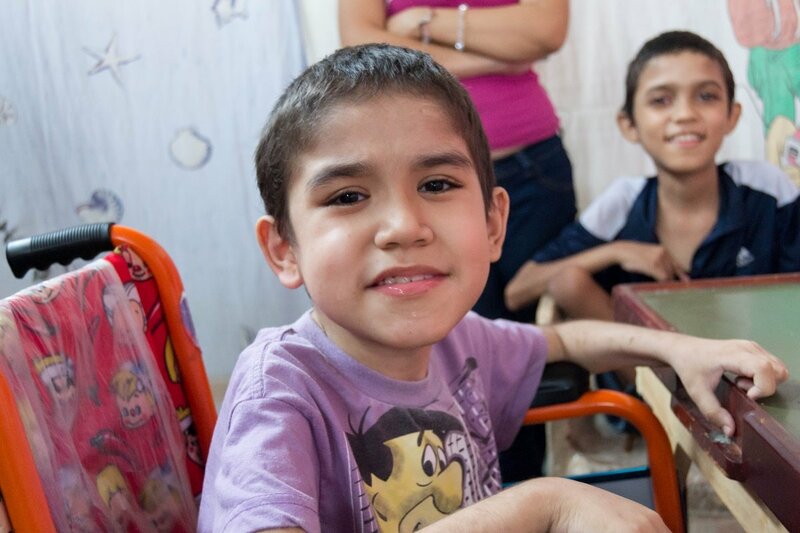 Isaías is in the paediatric hospital in Barquisimeto, waiting to have surgery, but he has nothing to eat. We were contacted and the next day Maritza, a volunteer from El Trompillo, visited Isaías and his mom and took them some milk. “The boy would not stop giving me kisses and asking for a blessing by putting his little hands together. His mother is very grateful and said “God bless you, God bless you all”. Yan, from San Fernando de Apure, is a happy, friendly, playful boy. He lost a leg in a fire and his family is very poor. Georsara (pictured) and a group of volunteers have managed to find him a prosthetic leg that will allow him to walk again. We are supporting Yan so that he can travel to Caracas for his rehabilitation, looking for funds to complete his prosthetic. We hope to soon see him with his new leg, playing football again. 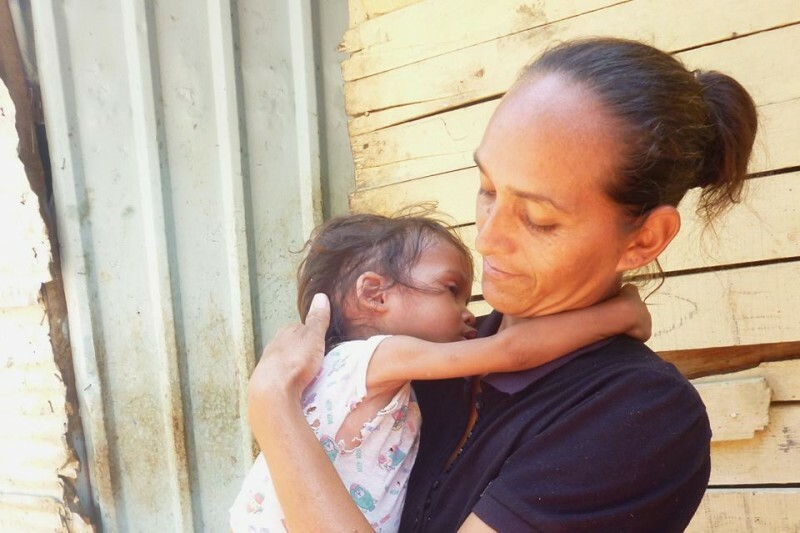 We supported Nancy when she was hospitalised in Guaiparo with sesvere malnutrition. After weeks of care, daily soups, medical treatment and support from many people, she left the hospital. Las week Nancy called us. Her mother had malaria and they had nothing to eat at home. María José and Nuria visited their home and took them food. Nancy knows she can count on us and all of you. She should be able to count on institutions to protect her. At 8 years old it was now her that wanted to help her mother … Nancy keeps on smiling and that cheers us on and increases our commitment. You are behind every case we tell you about, every programme, every child, every medicine, every notebook, every smile; you support us and help us continue. 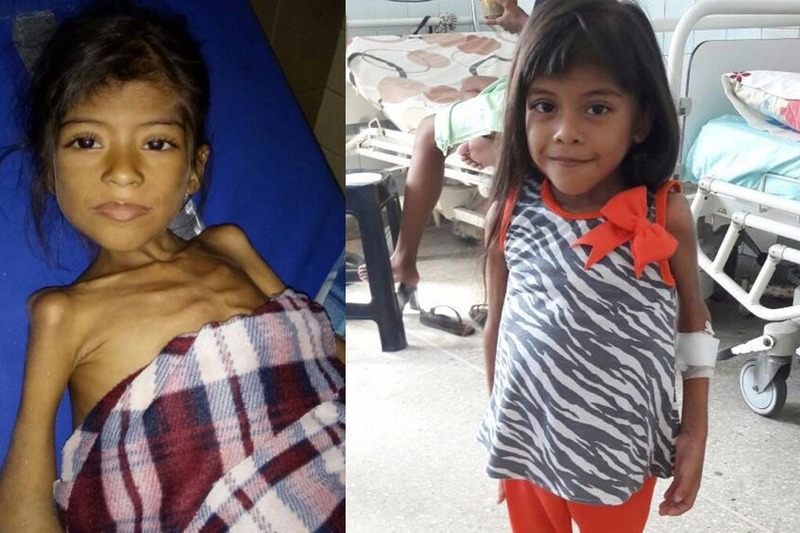 Experts from the United Nations note in the report published this month the “alarming living conditions in Venezuela, that are worsening every day … millions of people are suffering through lack of food and essential medicines”. The Venezuelan government forbids humanitarian aid entering the country. The international community must act to stop this. It is a difficult fight, but we do not give up and we will continue to grow, fighting hunger with solidarity, creating connections, building and supporting those networks of love that make miracles possible… thank you! Sometimes it is hard to know what to tell you. We move, every day, between shadows and light. The shadows of the skyrocketing rise of malnourished children, the suffering of people that have nothing to eat, the inconsolable cries of mothers that lose their babies… (children that all of us lose along with them). The solidarity and resistance light up dark corners and overcome obstacles. They spring up where we least expect it, with a call, a soup, support from different places… an invisible network that grows in and out of Venezuela. A network that comforts us and supports us. The light comes from seeing children gaining weight, eating, smiling and playing, seeing communities organise themselves … they are our hope. With these lines, today, we show some of those shadows and some of the light, in Bolivar. Some of the photos are hard to see, but we think that they are necessary; with respect and pain we share them. Others make us happy, they are fresh air that bring us life. - On November 9th, in the Guaiparo children’s hospital in Bolivar, Leriannys died; she was 17 months old and weighed 4 kilos. She died of malnutrition, of injustice, of abandonment, of corruption. We received a call from the hospital that day, to see how we could support 4 more children that were hospitalised for severe malnutrition. They did not even have paracetamol to lower their fevers in the health centre. One of those children was Gilbert Mendoza, 3 years old, with his little bones showing through his skin, his feet swollen and unable to sit up. An image that stays with us. As does that of Carmelita, his mother, crying. Those days, more generous, giving people came together, preparing soups, providing blankets and medicines … being there… Gilbert, from the Warao community, also died. We were too late to save him. We were there for his last days and to share in his mother’s pain, which tears us apart. That week, Nicolás Maduro stated that “Venezuela does not need humanitarian help”. But 43 children have died from malnutrition and associated diseases this year in the Guaiparo hospital alone. Today that health centre is treating around 20 severely malnourished children without medicines, without food, without support from the State. This situation was reported, along with photographs, on social networks. The state, instead of worrying and sending health and nutritional support to children who need it urgently, sent the Sebin, the military police. They took all security cameras and forbid taking and distributing pictures of malnourished children. … a photograph showing the current emergency is a crime. This week, the Health Ministry not only denied the existence of a humanitarian or food crisis, but stated that “Humanitarian aid will be forbidden from entering Venezuela”. Through this denial and censureship thousands of children are being left to die without treatment. We have a state that has no trace of humanity. The problem is structural, the construction of a humanitarian channel is urgent. According to Caritas 300 thousand children can die from malnutrition. They are currently dying, little by little. We need policies that protect the most vulnerable, support to health centres, production and employment policies. In the meantime, we keep going, supporting more children, increasing and improving that support, to the best of our capabilities. being organised, for children who arrive at the paediatric hospital with mild to severe malnutrition. A space has been made ready and we are supporting 25 children, as well as developing strategies to support them when they leave the hospital. We are infinitely grateful for the efforts and dedication of the medical staff who work with so little, with worry and love. As we write these lines, we are informed that 8 boxes of high-calorie nutritional supplements arrived in Caracas from Miami. This will go directly to the three nutritional recovery centres in Ciudad Guayana for the children most in need. The solidarity fills us with joy and hope, it keeps us going. We also have just heard that the company where a friend works acquired and donated a medical equipment needed to carry out electrocardiogram tests to the children in the Guaiparo hospital. Solidarity grows… women are organising themselves to prepare soup and take it to the hospital. From abroad, more and more Venezuelans organise activities to support our projects and those of many others that work for Venezuela. Next January, with the San Martin de Porres parish, the Sapagua group and community volunteers, we will open a new nutritional recovery centre, in a critically poor area of the city. We will treat 40 malnourished children, monitoring their weight and height and providing nutritional support. We can do this thanks to your support and people like you. 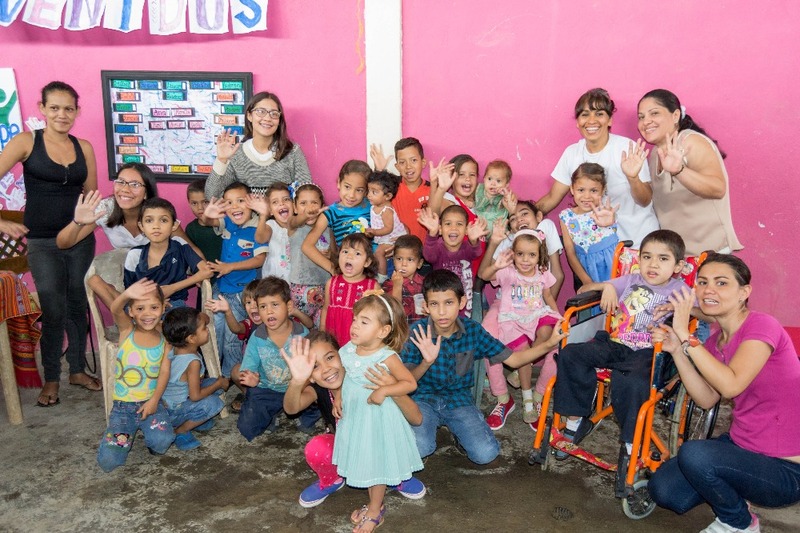 In Brisas del Sur, more than 30 children have been discharged from the programme, because they have reached the standard height and weight for their age… they will continue to be monitored. Some others, like Jhonnelys , after months of support, have almost reached the expected weight and height for their age. The light will win against the shadows. We have so much to give thanks for! The support from each and everyone of you has been and is essential to our work. Thank you so much for your support. We are building together a new Venezuela filled with solidarity. We will not give up. Agrego mi granito de arena. ¡Animó a las familias!